is a leading business in the sphere of handyman services in London. We have an incredibly motivated and loyal team of professionals that have skills in various trades and can complete any handyman job with great precision and speed. No matter whether your handyman needs are domestic, office or commercial, we will not only assist you in fulfilling them, but we will also do that at a budget-friendly price. We provide a remarkably wide range of handyman solutions in London each of which is offers outstanding quality, because it is carried out by trained and meticulous experts. There is no limit to the scope, nature or complexity of the jobs that you need to get done. We are properly equipped and very experienced to tackle any challenges. Our competent and qualified handymen leave no room for mistakes even when working on last-minute projects. Tiling and grouting – You can hire our diligent fitters to tile your entire home or to change just a few tiles on your floor. They can also remove old grout and regrout your bathroom or shower quickly and effectively. Furniture assembling – One of our most in-demand handyman service has to do with assembling flat pack furniture for offices, kitchens, bedrooms, gardens, patios and etc. Hanging mirrors and paintings – Our handymen can hang object of a varying size and weigh on your walls. They will not drill until they are certain that they are no cables, pipes or wires under the wall. Fitting curtains and blinds – The multi-skilled professionals that work for us can even fit different kinds of curtains and blinds, saving your great efforts and time. Fixing or replacing door handles, shelves, locks and any other items and furniture pieces that are broken or damaged in some way. 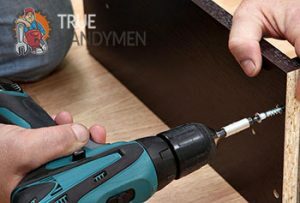 Don’t hesitate to contact True Handymen even if you think that your handyman request is too unusual. When a customer asks us to provide them with professional assistance that is not included in our list of basic handyman services, we are ready to discuss and consider possible solutions for the problem. Our friendly and driven consultants will easily connect you with the right professionals for the job who will offer you a customized handyman service that will meet your needs. Once our amazing staff comes up with a perfect solution for your case, it will estimate your costs and quickly provide you with a reasonable personalized quote. You can rely on True Handymen for same-day and last-minute handyman jobs. We respond quickly to emergency bookings, because our helpful team is very well-organized. Although many of the projects we take on require our handyman to estimate the scope and character of each job, they complete their work in a speedy manner without sacrificing on quality or precision. We are open on weekends, as well as on banking holidays since we don’t like to keep our clients waiting.